News and Information Direct from NASA: Houston, we have a problem with Zika. 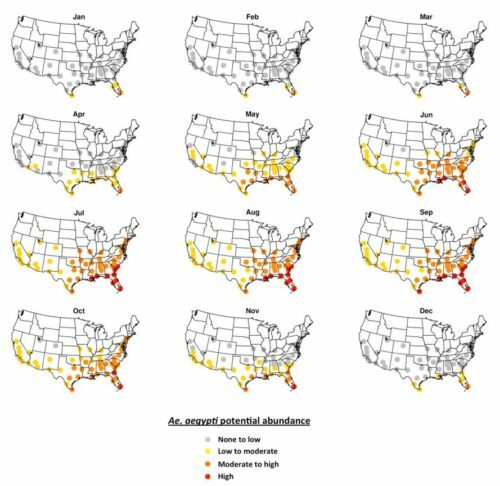 Recently released maps from NASA scientists details the potential US spread of the Zika virus throughout the US. The news isn’t good, as southern states and other major cities could be in Zika’s cross hairs. We might have us a problem. First reported by CNN, the maps are courtesy of a recently published PLOS Currents study. 50 different cities were examined that fall within the known range of the female Aedes aegypti mosquito. NASA experts took into consideration temperature, rainfall, poverty levels, and other facts in their attempt to predict the spread of the mosquitos. With summer soon upon us, rainfalls will increase, and so do the changes of hatching mosquito eggs. Not surprising, the hotter and wetter parts of the country are more likely to be affected. NASA scientists predict, by June, all 50 cities to show a low to moderate abundance of the pests. It just remains to be seen how far north these mosquito could survive. Maintaining your property during mosquito season helps substantially. Since mosquitoes multiply and grow in standing water, make sure there are no bird water feeders or nearby puddles to attract them. Wear neutral, light-colored clothing to avoid advertising your blood. The best insect repellents are sprays or lotions containing DEET. They’re not recommended for use on infants and toddlers. For use on children consult your physician. The EPA states that DEET is safe for adults when used as directed.